I've been a bit of a lurker here, but finally decided that posting some of my stuff on the boards might actually help me get some hobbying done. I'm a terrible magpie for projects, and generally have a few on the go at any one time. Unfortuantely this means that most of my armies are half built/painted. Not good. However, I've been inspired recently by the wonderful work of 1000heathens, Flint, Lorenzen, Pyromancer and all the other wonderful blogs to start getting a bit more of the grey plastic painted. I'm planning to hopefully cover some loyalist space marines (Dark Angels/Badab), pre-heresy Blood Angels, and some post-heresy Deathguard. 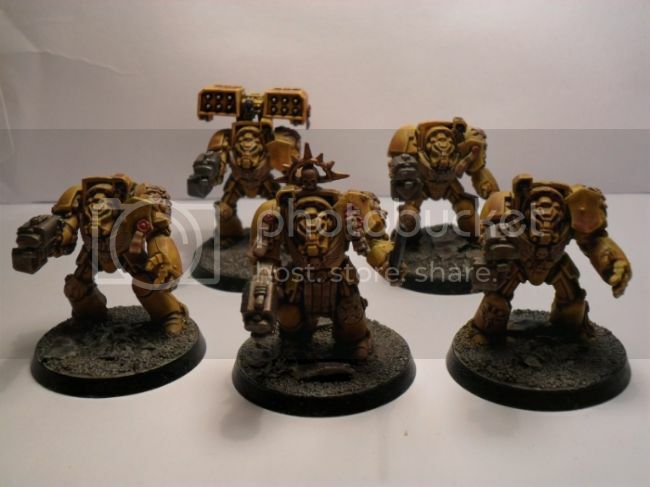 To kick off though I'll quickly show some of my completed Imperial Fists. 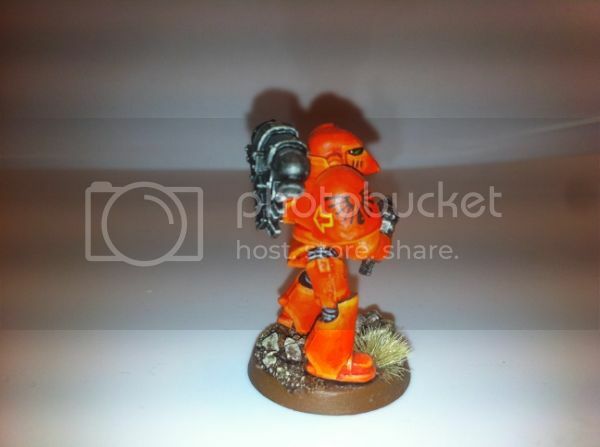 They were created to get back into the hobby quickly - with the idea of speed painting a small elite army. My first look was at Grey Knights, but to be honest, a quick flick through the newest codex put me right off. I'm a bit of a fluff fiend and they have some of the most silly background/characters going. That, coupled with the seemingly BoLS -sponsered Grey Knights power-gaming around about the time these were started meant that didn't exactly seem a good fit to get back into the hobby. Deathwing on the other hand...Small army size, terminators, and cool rules. Never one to do things easily tho, I quite fancied trying a little more difficult painting than bleached bone plus a brown wash. So, I stumped for yellow (a colour i've NEVER managed to paint) as an alternative. From there it's not a massive leap to the Imperial Fists and their 1st Company! As a final aside, i'm very VERY fond of the almost sloppy/gritty work of John Blanche. As long as i've been in the hobby i've been inspired by the almost abstract way he does things. So many of my models will be a bit gritty, and while i'll be trying my best with all details etc, it's tabletop forces i'm looking for, and one that will hopeful reflect the grimness of the 41st millenium. Close up of a "tactical" Terminator. Bolters are now drilled out obviously. I've got more WIP shots obviously, but they are largely as above - if there's any particular interest in seeing more pics of the termies then i'll of course pop some up. Otherwise, i'll be keeping this plog for more recent modelling and painting. Hope to hear some C&C! As an aside, i'm games-mastering for my wargaming group, and we are currently in the process of a big-ish campaign. The fluff is detailed in my signature, and any C&C regarding that would be very helpful too! Edited by November, 14 November 2014 - 11:14 PM. Nice stuff. I really like the muted yellow you've used for your IF. Looking forward to all the different things you're working on, except maybe the Death Guard, lowsy traitors. The Frater formerly known as Asamodai. Nice start. Keep em coming and ignore the loyalist taking pot shots. Your style will look great on Death Guard. Really like your take on the IFs... Especially your deep shading! I think drilling or at least painting black dots on the barrels would add to the overall impression. 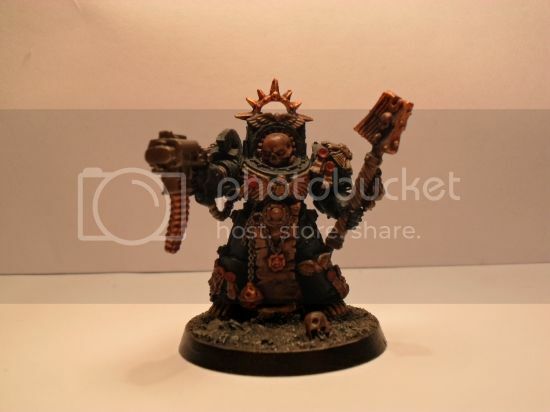 Since you are a new member let me point out that Xenos pics are not allowed in B&C - as such I removed the ones containing Orcs. No cause for alarm, just keep it in mind in the future... And since you mentioned it, a close up of the Chaplain would be great! I also suggest to take a minute to go through the forum rules and feel free to ask any questions. Edited by Captain Semper, 23 March 2014 - 10:30 PM. @Asamodia - Thanks, the shading is a hodge-podge of washes which is a bit artless, but makes them look nice and grimy on the tabletop. My usual opponents usually play on a cityfight style table so the darker shading and tones help them stick out a little less! @Forte - Cheers, big fan of your Slaneeshi log, excellent models and even better painting! I'm looking to get the deathguard models built in the week, just waiting on a few choice bits from Forgeworld and Anvil Industries. The plan will be for the DG resin kit, with Phobos bolters to be suitably "heresy-ish". 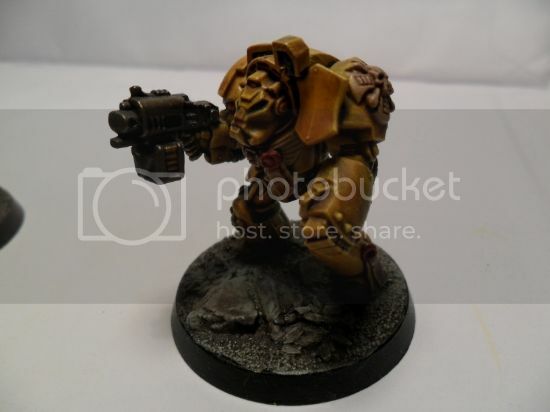 Always nice to see another scion of Dorn, that is a nice gritty industrial yellow there. Currently working on a test model for the Blood Angels - the FW kits are really nice, and the quality of the casting was a pleasant surprise. I've had Hydra's and other IG kits in the past, and a few were appalling and needed A LOT of work to make even halfway presentable. Hopefully i'm planning to go for a bit of a brighter basing scheme - I like the cityscape look and it was quick and easy to do, but I think something a bit warmer might be better with the red of the BA. Plus I have static grass that I want to use! So, as I mentioned in my first post, my plan is to work on a force of 30K. 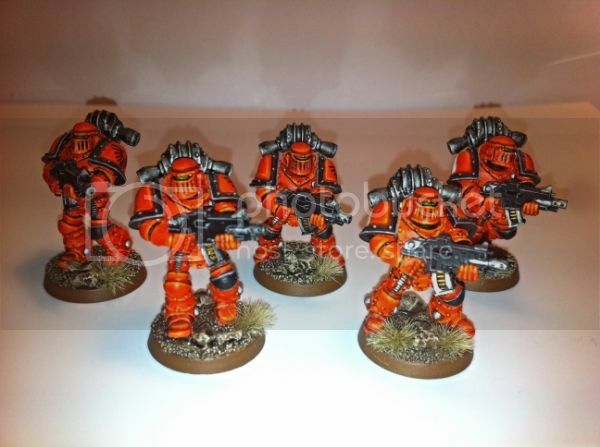 I like the Pre-Heresy background of the Blood Angels, and I think their vibrant reds can make for a really smart looking tabletop-standard force. 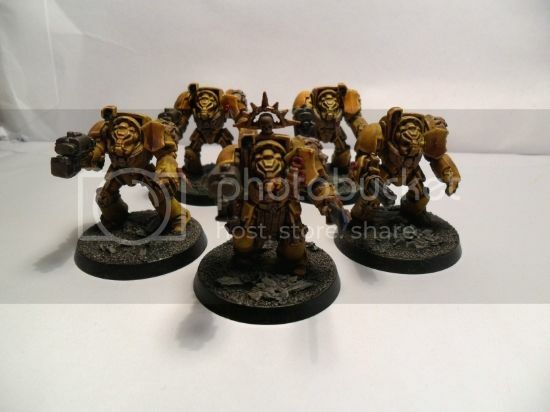 My Imperial Fists are largely converted Assault on Black Reach termies, with the odd WD freebie thrown in, so I was really looking forward to trying my modelling and painting on the lovely Forgeworld kits. 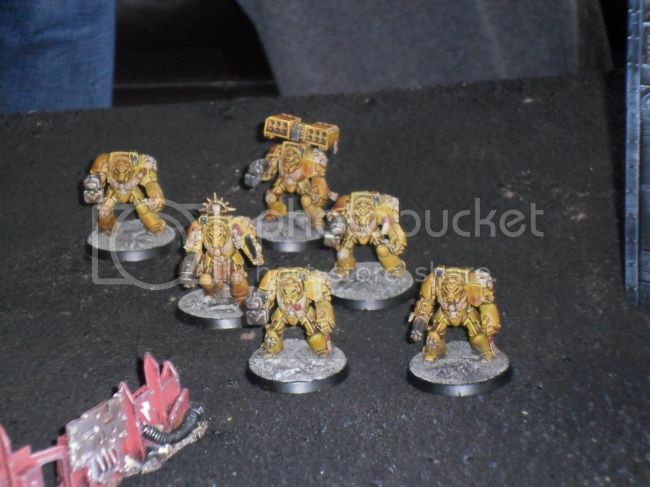 All the armour marks are cool in their own way, but something about the crusade/iron patterns jibes with me - I think it's because we'd never seen these marks in model before, whereas the other marks had (in various forms) popped up as either conversions or as part of marine sprues. For these models I wanted a cleaner style than the "gritty" looking Fists - unlike the IF army, who I envisage as slogging through some apocalyptic cityfight in the grimdark 40K era, the Blood Angels are early in the Great Crusade and generally more hopeful 30K. 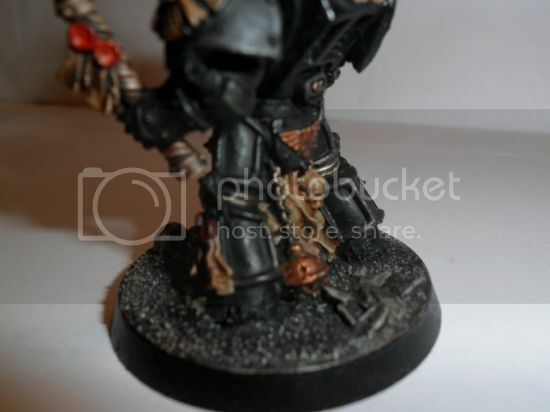 Therefore, I figured that while the armour marks and equipment are more utilitarian than their 40K equivalent, they are perhaps in a slightly better state of repair and cleanliness. After all, they aren't yet the honoured heirlooms that they will eventually become to the Blood Angels. Despite their artitisic (and in-real world team Renaissance-inspired) bent, in my opinion in 30K that is very much the signature of the Emperor's Children, and as such i'll be keeping the gold/filigree to a minimum. I've deliberately made the pic a wee bit bigger to make it easier to see, following ones will be the usual size! Apologies for the dreadful pictures - as many people have already posted in their own logs, it's hard to get the colour saturation correct, and light appropriately! @Captain Semper - Thanks. I really like you Emperor's Children. I had a good look at your plog tonight, very very nice. @Deathspectersgt7 - Thanks very much for the comment, much appreciated. @Jaspcat - Thanks, I think that people's differing interpretations of the legions is part of the wonderful hobby that we enjoy! As of yet, there isn't anything set in stone regarding all the details of a force in 30K, meaning that no-one is "wrong" per se. I really like your more ornamented models, and I think they'll be a great army once completed. I guess we could argue that as the legions developed they established their own character. Perhaps my men are from earlier in the Crusade? Or perhaps my ascetic Terran commander never got to like all those rubies and ivory? So...been beavering away at my Blood Angels, mainly working to build some tactical marines up. 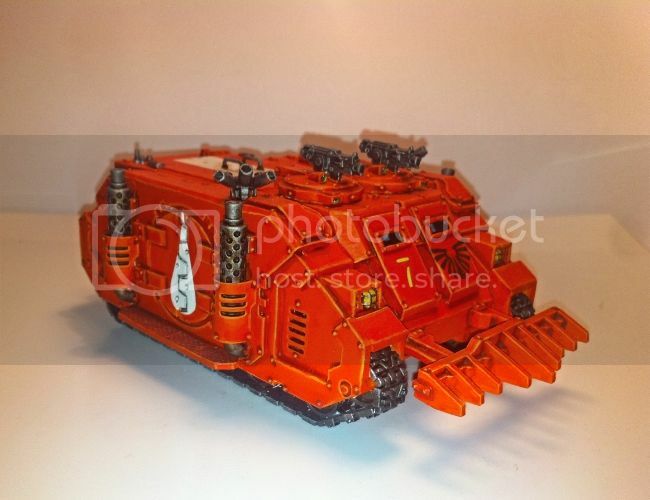 Like many "30K" player i'm quite keen to have an army that is useable with 40K - namely the current Blood Angels and Space Marine codices. 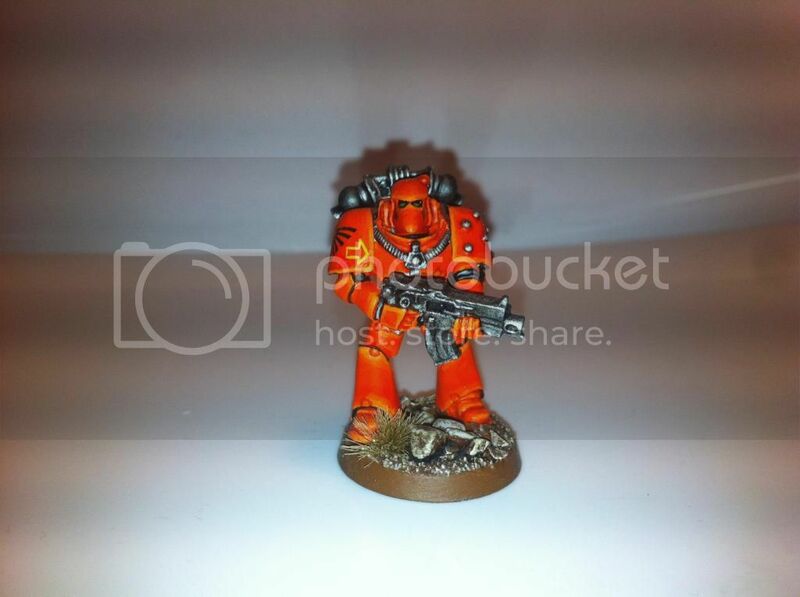 My plan is to complete two full 40K equipped tactical squads, that combined (and loosing the special weapons) can do as a larger 15 marine squad for the Legion lists. Similarly, I'm hoping to do two assault squads in the same manner. I realise this gives me a smallish 30K troops complement but realistically i'll be playing with the BA codex more often than not. In that vein - i've been doing a test model for the Mark VI squad. I'll be honest i've never been a fan of their 40K incarnation (namely the horrid beaky helms) but the full armour marks in resin are actually pretty nice. There is definitely a 2nd ed. quality to them! Very tidy work mate! Love the bases too! Let's see a whole squad of them - 20-strong please! How about a whole Company, great free- hand on the Beaky Boy. Love that color for the BA's. Just pops out and is full of character thanks to your awesome painting skills. @Deathsepectersgt7 - Thanks for the comment, but i'm not sure the missus would be happy with me buying that amount of plastic crack! However, i'm planning a fairly large 2000-2500pt list, mainly so I can mix and match models and units depending on the list size. @Helterskelter - Cheers, i've been inspired by the RTB01 marines/RT artwork in my conversions/builds for this project so it's perhaps starting to bleed through into the painting too. Must be all that squinting at my dog-eared copy of Rogue Trader. The markings are inspired by the RT artwork too, even if the ranks etc have been retconned long ago. It'll be interesting to see what Forgeworld do with the BA in the inevitable Signus Prime book - presumably they'll be shifted to metallic red in the style of the Badab chapters. Boo Hiss. @KBA - You're far too kind, however my painting has definitely improved with practise, and with the help of some fantastic tutorials on B&C. I've just been trying to get the highlighting a bit better than my tabletop standard Fists. I'm particularly proud of the eye lenses on the Mark VI marine, and i'll probably go back and re-do some of the Mark II marines to match though. 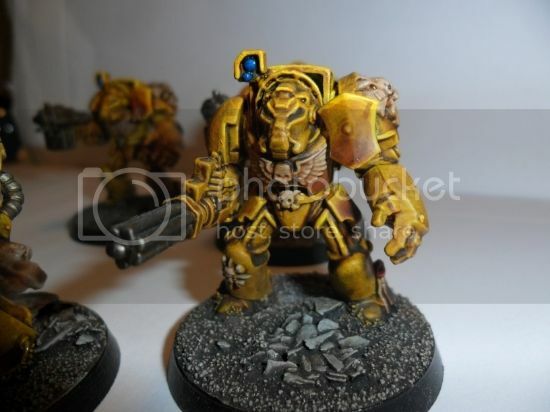 My initial plan was to go back and weather the models to match my Imperial Fists, however after all the kind comments approving of the brighter/RT-type style i'll probably leave them as they are for the moment. Good work on the BA! I think that I prefer the light red that you have done, although there are certainly some very well done dark reds on B&C. "Tell them ruin has come to their world. Death, despair and red war ... Tell them their hopes and pride have come to nothing. Tell them their empty whispers fall upon deaf ears - their gods are dead, human reason has killed them. Tell them the Angels of Death have come. Tell them nothing can save them now." 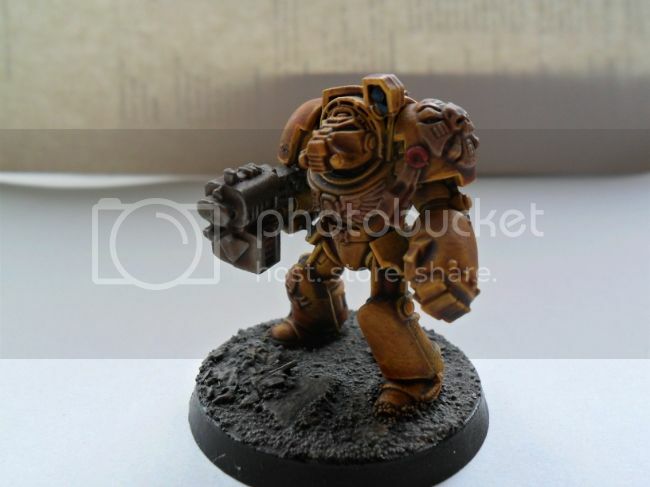 @KBA - To be honest I think the tutorials in the P&M section are all really useful, however the metallics and plasma coil painting guides are ones i'm using as we speak. I'm not sure if direct linking to outside of the B&C is allowed, but our cousins on Warseer have really good guides for painting eye lenses. Although it's definitely uncool to admit - I use the GW painting books a lot, I consider myself a tabletop-standard painter and I find that their techniques are easy to follow, and since I mainly use GW paints it's easy to match schemes. Again, I think they give good advice on glazing and washes for average painters like me. It's amazing how a laze/wash can either make a model look nice and shaded, or if overused utterly drowned and rubbish. 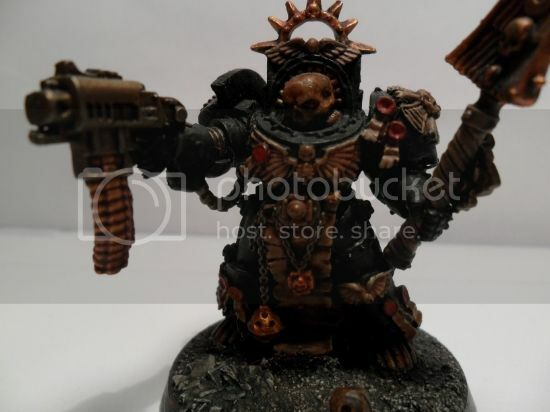 Having had a look at your blogs tho - i'm not sure you need any help, I love your Raven Guard models! 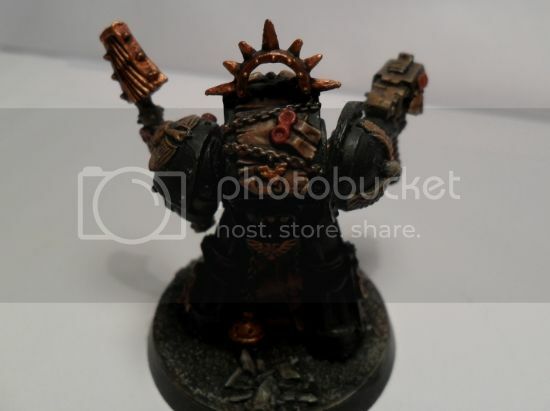 @Pyromancer - Thank you for your comment, as I said in my first post, your Iron Warriors are one of the big inspirations for my plog. Not only that, but I think they showcase some of the best sons of Olympia on the web either, pre or post-heresy. 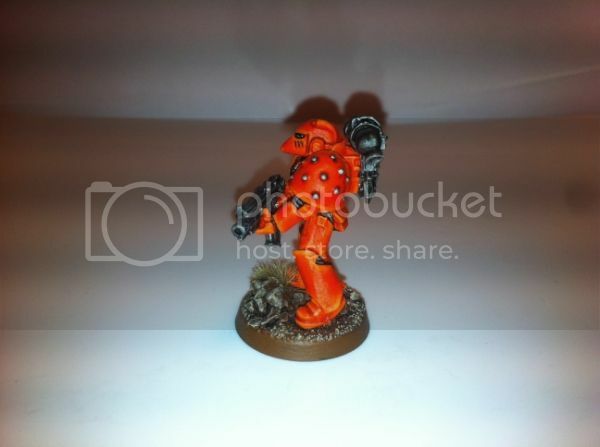 Fanboi gushing over - I've been finalising the first five marines of the first tactical squad. 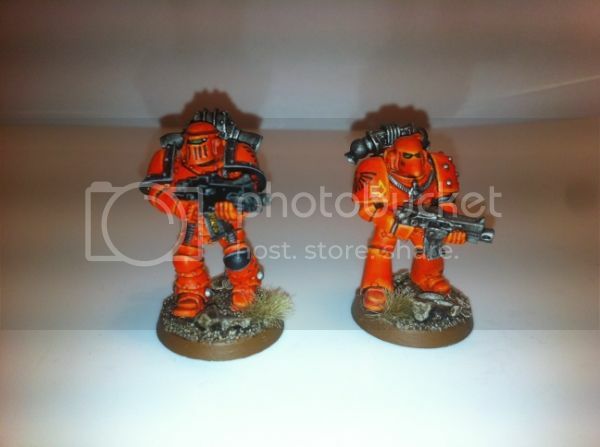 As I mentioned, these are built with 40K in mind, so are the standard bolter marines. I'll have some special and heavy weapons to follow later in the week hopefully. I think i've managed to hit a decent pace with these. It's really easy to obsess over the detail in the FW models, so i've tried to strike a balance between completing them and agonising over every highlight. My basing scheme has been reasonable replicable too - this was something I found helped on my IF army. I think a nice, unified scheme, without too much detail helps draw the eye to the model and keep a force unified. With the legions in general a unified scheme is obviously pretty straightforward, but the 40K BA lists will eventually include some gold, white and blue marines and i'm hoping the bases will tie them together. 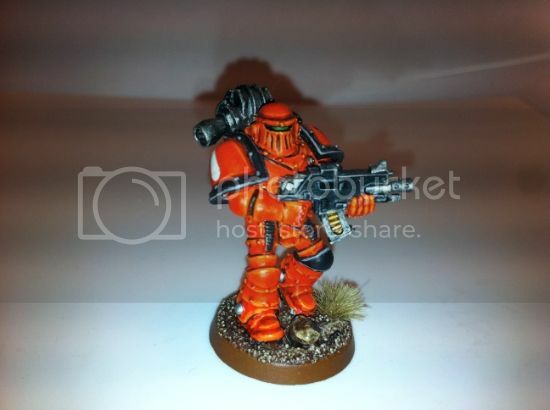 I've been using some of the Army Painter basing kits as well as some very old GW stuff, i'd definitely recommend their turf to anyone looking to jazz up their bases. Anyway - rambling over here are my new resin reinforcements! So, laid down the basecoats on a fair few marines now, as a wee break from the infantry i've rewarded myself with building and painting a Deimios pattern Rhino. It's a really nice kit, and as someone who had a RT rhino, it's a fair approximation of the older style while keeping it up to date and in sync with the current SM range. Difficult to get a good picture of a vehicle with my current psuedo-lightbox set up. I'll hopefully get a better picture of the second one when it's done. Decided to redo the plamsa weapons, tried to do some OSL and it just looked appalling. After some hasty touch-ups to the armour, i'll have a go with a a bit more understated plasma coils tonight. Lord Sondar very kindly sent me a great guide for painting faces and hair - i'll be redoing the face on my sergeant to match the newer technique.